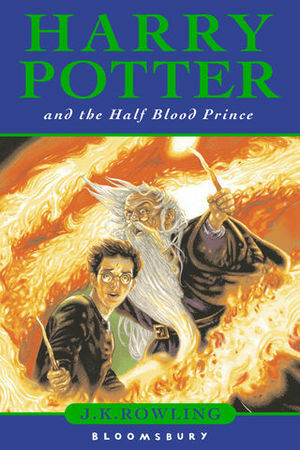 Harry Potter and the Half-Blood Prince is the sixth novel in J. K. Rowling's Harry Potter series. Set during Harry Potter's 6th year at Hogwarts, Lord Voldemort is definitely back and with a vengeance. Harry finds his world is yet again changing. Wizards and witches and Muggles are dying despite the efforts of the Ministry of Magic and the Order of the Phoenix to stop them. The war is back on. Despite the danger, Harry and his best friends, Ron and Hermione, reunite and return to the familiar life of Hogwarts for their 6th year. They find yet another Defence Against the Dark Arts teacher; Professor Snape. They begin their N.E.W.T. classes in preparation for life after Hogwarts, and Harry gets some much needed Potions help from the mysterious Half-Blood Prince. Quidditch is as popular as ever, Harry is nominated Gryffindor Quidditch Captain, and he finds himself reforming his team. As well, this book sees the introduction ever-popular Slug Club, along with the appointment of a new Potions teacher, Horace Slughorn. Romance again comes to Hogwarts, and is a welcome balance to the grim happenings elsewhere. Harry deeply questions his own feelings for Ginny Weasley, Ron's younger sister, while trying to understand the effect it is having on his friends. Yet while life at Hogwarts continues, the deaths also continue, with someone trying to bring it into Hogwarts. Danger seems to lurk around every corner, and Harry is as determined as ever to unmask it. Albus Dumbledore takes Harry under his guidance and together they explore Lord Voldemort's past, to find a way to stop him before it is too late. Ultimately, Harry finds he must accept what he must do as The Chosen One against Voldemort and choose between what is right, and what is easy. When it was released on 16 July, 2005, it was the first book in the United Kingdom to have a simultaneous standard print, large print, and Braille edition release. Within the first 24 hours, the book sold 6.9 million copies in the U.S. alone, roughly moving 250,000 an hour, making it the fastest selling book in history. It generated more than $100 million in sales out of the gate, outpacing even the combined take of the top films at the box office. Bookseller Barnes and Noble reported sales averaging 105 copies per second in the first hour of sales. It is also the first book in the series to be shorter than the book preceding it. It is Harry Potter 's sixth year at Hogwarts School of Witchcraft and Wizardry. As Voldemort's sinister forces amass and a spirit of gloom and fear sweeps the land, it becomes more and more clear to Harry that he will soon have to confront his destiny . But is he up to the challenges ahead of him? –Rufus Scrimgeour, to the Muggle Prime Minister. The Muggle Prime Minister receives a notice that Cornelius Fudge is to meet him. He then recollects Fudge's earlier meetings with him: his first meeting with Fudge soon after he became the Prime Minister, Sirius Black's escape from Azkaban, the Quidditch World Cup, the Triwizard Tournament and the 1996 Azkaban mass breakout. When Fudge finally arrives, he reveals a number of incidents which had occurred in the Muggle world and for which the Prime Minister is forced to owe responsibility: the collapse of the Brockdale Bridge, a supposed hurricane in the West Country, the deaths of Amelia Bones and Emmeline Vance and the insanity of Junior Minister Herbert Chorley which have all been caused by Lord Voldemort, his followers the Death Eaters and their Giant allies. In short, the Second Wizarding War has begun. Fudge also reveals that he has been sacked and replaced by Rufus Scrimgeour as Minister for Magic. Scrimgeour too meets the Prime Minister and discusses security arrangements with him. Narcissa Malfoy and her sister Bellatrix Lestrange visit Severus Snape at Spinner's End, a poverty-stricken neighbourhood in a northern mill town. Narcissa wants Snape to help her protect her son Draco, who has been made a Death Eater and has been assigned a mission by Lord Voldemort himself. Bellatrix advises against this, distrusting Snape for not taking part in the Battle of the Department of Mysteries at the Ministry of Magic, and for his many suspicious actions through the years which make her doubt whether Snape is actually on their side. Snape explains his behaviour as necessary to serve Voldemort in his role as a spy on Dumbledore, but still does not gain Bellatrix's trust. Narcissa then explains that Draco is almost certain to fail in the mission he was assigned for; she and Snape believe this is to punish the Malfoys for Lucius Malfoy's failure to retrieve the prophecy at the Department of Mysteries. Snape makes an Unbreakable Vow to Narcissa, magically binding him to aid Draco in his first mission as a Death Eater. Failure to fulfill the Unbreakable Vow will result in Snape's death. Bellatrix is astounded at this and finally believes Snape. Albus Dumbledore comes to visit Harry Potter at 4 Privet Drive to take him to The Burrow, where he would spend the rest of his summer holidays. Dumbledore reads Sirius Black's will: Harry inherits his deceased godfather's wealth, the Black family house at 12 Grimmauld Place, which Harry lets the Order of the Phoenix continue to use as headquarters, and the House-elf Kreacher, whom Harry sends to work at the Hogwarts kitchens. Dumbledore then chastises the Dursleys for their neglect and mistreatment of Harry but asks that he be allowed to return to Privet Drive one final time, and he and Harry depart. Harry notices Dumbledore has received a serious injury to his right hand, but the Headmaster dismisses it as unimportant. Dumbledore then asks Harry's help in convincing an old Hogwarts teacher, Horace Slughorn, to come out of retirement. They pay him a visit, but Slughorn is reluctant to return to the school, fearing it may put his life in danger from Death Eaters. Harry tells him that no teachers have died since Dumbledore became Headmaster, except Professor Quirrell, who was working for Voldemort. This dubious comfort, and the opportunity to get Harry to join his Slug Club, persuades Slughorn to return to Hogwarts. Dumbledore then drops Harry off at The Burrow, praises him for the way he has handled his godfather's untimely death and reveals that he would take private classes for him in the forthcoming academic year. Harry is warmly received at The Burrow by the Weasley family, who offer him Fred and George's bedroom to sleep in. Harry meets his best friends Ron Weasley and Hermione Granger and Ron's younger sister Ginny Weasley the following morning. He also meets Triwizard Champion Fleur Delacour, who is now working at Gringotts and is engaged to Ron's oldest brother Bill Weasley, which is not liked by Hermione, Ginny, and the rest of the Weasleys (except Ron). Later in the day, the trio receive their O.W.L. results; Harry and Ron receive 7 O.W.L. 's while Hermione receives 10. However, Harry is slightly disappointed as he has only achieved Exceeds Expectations in Potions, meaning he can no longer realise his ambition as an Auror as Snape only takes students who have achieved Outstanding into his N.E.W.T. Potions class. After spending the next few weeks at The Burrow, Harry and Hermione go with the Weasleys to Diagon Alley to get school supplies. Rubeus Hagrid is entrusted with providing security to the group. After a fight with Draco Malfoy and his mother at Madam Malkin's, the entire group go to Weasleys' Wizard Wheezes, Fred and George's successful joke shop. Harry insists on paying for the merchandise, but Fred and George refuse his money as he was the one who gave them the money to start the joke shop, and Ginny buys a Pygmy Puff as a pet. While still in the store, Harry, Ron, and Hermione spot Malfoy walking through Diagon Alley without his mother and follow him under the Invisibility Cloak to Knockturn Alley and see him enter Borgin and Burkes, a dark artefact shop. The trio wait outside, listening to Draco by Extendable Ears and watching him through a window. They hear Malfoy talking with the owner Borgin, about repairing an object and keeping another object safe. Malfoy also shows Borgin something which Harry suspects is the Dark Mark, the mark of the Death Eaters, and threatens Borgin by referring to the werewolf Fenrir Greyback. Harry comes to the conclusion that Malfoy has become a Death Eater and is up to no good, a theory which is rubbished by Ron and Hermione. –Luna Lovegood, about the D.A meetings. On the Hogwarts Express, Harry meets his other friends Neville Longbottom and Luna Lovegood and shares a compartment with them as Ron and Hermione are in the Prefect Carriage. By now, Harry finds himself attracted to Ginny, although she appears to have long given up on her crush on him and is currently dating Harry's classmate Dean Thomas. Harry and Neville are invited for lunch to Slughorn's compartment on the train along with Ginny and some other students with connections to well known or influential people. Before reaching Hogsmeade station, Harry enters Malfoy's compartment using his Invisibility Cloak to prove his suspicions of Malfoy. His suspicions are proved correct; Malfoy tells his friends Vincent Crabbe, Gregory Goyle, Pansy Parkinson and Blaise Zabini that he has become a Death Eater and he may not return to Hogwarts for his final year if the mission he was assigned by Voldemort is successful. Unfortunately for Harry, Malfoy notices Harry spying on him and once his friends have alighted from the train, he paralyses Harry, breaks his nose, covers the Invisibility Cloak on him and leaves him on the train. Nymphadora Tonks, who is assigned by the Ministry of Magic to guard Hogsmeade, comes to Harry's rescue. She takes him to the school, where he is received by Snape. At the Start-of-Term Feast, Dumbledore announces, to Harry's shock, that Snape is taking over the post of Defence Against the Dark Arts teacher, while Slughorn will be taking Snape's vacated job as Potions Master. This allows Harry and Ron to continue with Potions, as Slughorn takes students who have received Exceeds Expectations in their Potions O.W.L..
–Ron, about Harry taking the Half-Blood Prince book. Harry and Ron take up Charms, Defence Against the Dark Arts, Herbology, Potions and Transfiguration as their N.E.W.T. subjects. During the first Defence Against the Arts class of the year, Harry receives a detention from Snape as he had talked back to him following Snape trying to use him as a guinea pig to show how a nonverbal spell works. Later that day, they attend Potions, where Harry and Ron receive old copies of Advanced Potion Making from Slughorn as they did not buy the book. Harry's book, previously owned by someone named The Half-Blood Prince, contains a large number of shortcuts on making various potions, which prove useful in brewing the Draught of Living Death. To everyone's surprise, Harry's potion is adjudged the best by Slughorn and is awarded a bottle of Felix Felicis as a prize. When Harry tells Ron and Hermione about the book, Ginny overhears them and angrily confronts Harry about following the directions of this mysterious book in fear that it may be cursed like Tom Riddle's diary. Hermione then tries various spells to reveal the true nature of the book, but the book proves to be a normal one, allaying Ginny and Hermione's fears. –Dumbledore, about his assumptions about Riddle plans. As promised at The Burrow, Albus Dumbledore begins the private series of lessons with Harry concerning Lord Voldemort. In the first lesson, Dumbledore shows Harry the first of a number of memories he has collected concerning Voldemort's past using The Pensieve. It shows a former Head of the Magical Law Enforcement Patrol Bob Ogden visiting a man named Marvolo Gaunt in order to summon his son Morfin to a Ministry hearing in connection with an attack on a Muggle named Tom Riddle Sr.. A huge commotion occurs; Morfin attacks Ogden, with Marvolo stoutly defending his son's actions. Marvolo also tries to attack his daughter Merope after finding out that she has a crush on Riddle. After viewing this memory, Dumbledore tells Harry that both Marvolo and Morfin were sentenced to six months and three years imprisonment respectively in Azkaban due to their behaviour to Ogden and other Ministry officials. He also reveals that Merope Gaunt was Voldemort's mother and Riddle was his father, thus making Marvolo Voldemort's maternal grandfather and Morfin his maternal uncle. He then speculates that following Marvolo and Morfin's arrest, Merope may have offered a Love Potion to Riddle, as a result of which they fell in love and got married. Later, when Merope was pregnant, she may have stopped giving the potion to Riddle, which may have led to Riddle, who had no love for Merope, leaving her and returning to his village. Harry, the new Gryffindor Quidditch Captain, holds trials to select the team for the annual Quidditch Cup. Due to Harry's popularity, it proves to be extremely taxing and difficult, with even first-years, Ravenclaws and Hufflepuffs turning up for the trials. In the end, Harry selects a team which includes among others, final-year Katie Bell, the only member remaining from the Quidditch team Harry joined in his first year, Ginny and Ron, who returned to his position as Keeper, staving off competition from another final-year and Slug Club member Cormac McLaggen. Later Harry, Ron and Hermione go visit Hagrid, who is upset at them as they had dropped his subject Care of Magical Creatures. After lying to Hagrid that they had dropped Care of Magical Creatures as they could not fit it into their timetables, Hagrid reconciles with them. When the trio return to the Great Hall for dinner, Harry finds out that Hermione had used the Confundus Charm on McLaggen so that Ron would become Keeper, but he does not tell Ron this. Slughorn then invites Harry and Hermione for dinner with the other Slug Club members in his staff room, which Harry declines as he has to do his detention with Snape. –Description of Harry's obsession about the Half-Blood Prince book. Harry finds a couple of spells scribbled on the Half-Blood Prince's textbook. He tries one of them (Levicorpus) in his dormitory, but points his wand at Ron by mistake, as a result of which Ron hangs by his ankle from the ceiling. Later that day, Harry, Ron and Hermione go to Hogsmeade, where they witness Katie being cursed after touching a strange necklace. Remembering seeing the same necklace in Borgin's shop, Harry voices his suspicions of Malfoy to Professor McGonagall, but she, like Ron and Hermione, rubbishes his theory, stating that Malfoy did not go to Hogsmeade as he had a detention with her, and that there is no proof that he bought the necklace. –Tom Riddle (child), to Dumbledore. In his second lesson with Dumbledore, Harry first sees Caractacus Burke talking about a locket of Salazar Slytherin's that a pregnant and desperate Merope Gaunt had sold him, Riddle having abandoned her when she stopped giving him Love Potion, then goes into a memory of Dumbledore's to the orphanage that Riddle had grown up in. Harry learns that Merope had later died in childbirth, and that even at an early age, Riddle had developed his powers, which he used to punish people who annoyed him and had a sadistical, cruel and independent nature, just like the adult Voldemort. During a Herbology lesson, Ron expresses his jealousy of not being invited to Slughorn's upcoming Christmas party, to the point of teasing Hermione about it. When she tells him that she was planning to invite him, however, his attitude changes, and they begin to show signs of attraction to each other. Harry is unsure how he feels about this, remembering his unsuccessful relationship with Cho Chang during his fifth year. With Katie unable to play, Harry recruits Dean Thomas onto the Quidditch team, which continues to improve. On their way back from practice however, Harry and Ron come across Dean and Ginny kissing behind a tapestry. Harry feels a huge surge of jealousy toward Dean, while Ron and Ginny have a heated argument. Ron states that he doesn't want to see his sister "snogging" (kissing) people in public, while Ginny tells him that her love life is none of his business, and that he's only upset because he's never kissed anyone, referencing Harry and Cho's relationship and revealing that Hermione had once kissed Viktor Krum. This piece of information wrecks Ron's relationship with Hermione, as well as his Quidditch skills, and badly alters his personality. Harry meanwhile tries to convince himself that his feelings for Ginny are entirely elder brotherly, but eventually realises that he has fallen in love with her. To improve Ron's Quidditch and mend his friendship with Hermione, Harry pretends to slip Ron some Felix Felicis on the day of the match between Gryffindor and Slytherin. Feeling lucky, Ron goes on to save everything the Slytherin chasers throw at him, and Gryffindor hammers Slytherin. However, the plan backfires. After the match, Ron accuses Hermione of not having faith in his Quidditch abilities, because she thought he really had taken lucky potion, and starts going out with Lavender Brown to spite her. As Slughorn's Christmas party approaches, Hermione warns Harry that a number of girls, particularly Romilda Vane, plan to slip him a love potion, to get him to invite them. Harry gets round this by going to the party with Luna, while Hermione goes with Cormac McLaggen to get back at Ron (which she regrets very much later). During the party, Malfoy is dragged in, in trouble for lurking in a certain deserted corridor and claiming to be gatecrashing; Slughorn lets him off the hook. Snape however takes Malfoy out of the party and into a deserted classroom. Harry follows them both and overhears Snape offering to help Malfoy with his mission, which Malfoy flatly refuses, accusing Snape of trying to interfere. –Rufus Scrimgeour, after Harry negation to work for the Ministry. During the Christmas holidays at the Burrow, Harry tells Ron, his father Arthur Weasley and Remus Lupin what he overheard, but they believe that Snape was trying to find out Malfoy's plan so he could tell Dumbledore. Later, Rufus Scrimgeour visits the Burrow, and requests that Harry appear to work alongside the Ministry, to boost the morale of the public. Harry turns it down, knowing that the Ministry is arresting and imprisoning innocent people and remembering how they persecuted him last year. On their return to Hogwarts, Harry notices Ginny is not enthusiastic about meeting Dean, and tells Hermione about what he heard between Malfoy and Snape, but she also believes Snape was working on Dumbledore's orders. When Harry mentions Fenrir Greyback, a werewolf Lupin had told him about during the holidays and the werewolf that bit him, she recalls Malfoy threatening Borgin with him, and Harry states that this proves Malfoy's a Death Eater. Hermione, however, got past this one, saying that it might have been "an empty threat." In his third lesson with Dumbledore, Harry learns that during his time at Hogwarts, Voldemort had gathered a mixture of friends who became the forerunners of the Death Eaters, and researched his family. He first investigated his father, and later assumed the name Lord Voldemort upon discovering his father was a Muggle and never attended Hogwarts. Dumbledore and Harry then go into Morfin Gaunt's memory, where he reveals to his nephew, Voldemort how he was conceived. After hearing this, Voldemort went on to murder his Muggle ancestors, taking revenge on them for abandoning him, eliminating the last of the "unworthy" Riddle line, stealing Morfin's father's ring and implanted false memories into Morfin, framing him for the murders. In the next memory, Voldemort asks Slughorn about Horcruxes, which results in Slughorn yelling that he knows nothing about them. Dumbledore is confident that the memory has been tampered with, however, noting patches of grey fog that came up when Slughorn was shouting, and asks Harry to retrieve the true memory. Realising Harry is on to him, after a botched attempt to get the memory, Slughorn starts avoiding him, and Harry instead chooses to focus on investigating Malfoy, using the Marauder's Map, noticing that Malfoy disappears off it at certain times. –Hermione not finding about Horcruxes on the Library. March has arrived and on Ron's seventeenth birthday he consumes a number of Chocolate Cauldrons containing a Love Potion (courtesy of Romilda and intended for Harry). Harry takes him down to Slughorn for an antidote, and the three of them decide to have some of Rosmerta's Mulled Mead, originally meant for Dumbledore. Ron discovers, after drinking it, that it is poisoned, but Harry manages to save him with a Bezoar. Ron reconciles with Hermione and Ginny. Some time afterwards, Hagrid tells Harry that he overheard Dumbledore and Snape arguing, and Cormac McLaggen confronts Harry to ensure he can play in Ron's place in the upcoming Quidditch match. Harry also finds out that Ron has been avoiding Lavender. Later, at the Quidditch match, with Luna commentating, McLaggen grabs a beater's bat and cracks Harry's skull. Finally, in the hospital wing, Harry summons Kreacher and Dobby and orders them to tail Malfoy. –Dumbledore, about Tom Riddle's request. In their fourth lesson, Dumbledore is disappointed Harry failed to obtain Slughorn's true memory. Dumbledore shows him two memories: one of Tom Riddle being shown Salazar Slytherin's Locket and Helga Hufflepuff's Cup by a wealthy woman named Hepzibah Smith (both of which he later stole), the other of Riddle applying for the Defence Against the Dark Arts teaching post at Hogwarts, which Dumbledore rejects as he felt that it was an attempt by Riddle to further search the school for secrets and recruit followers. This post was thenceforth jinxed by Riddle; teachers never held the post for more than a year, suffering some terrible fate or humiliation which caused them to leave the position. –Harry, about the Marauder's Map. Ron wants to break up with Lavender but doesn't know now. Harry learns from Kreacher and Dobby that Malfoy is regularly visiting the Room of Requirement (which doesn't appear on the Marauder's Map), and spends the next few days trying to get inside. Not knowing what Malfoy is using it for, he has no success. Ron and Hermione come back from the Hogsmeade Apparition test, in which Hermione is successful but not Ron, who will take the exam with Harry again. Harry again fails to convince Slughorn to share his true memory, and Ron suggests he use the Felix Felicis. Harry takes the Felix Felicis and goes down to Hagrid's hut because Aragog died and Hagrid wanted Harry to go to the burial. On the way to Hagrid's hut Harry luckily meets Professor Slughorn on the way and goes with Harry to Hagrid's because he wants to collect Aragog's venom. Aragog is buried and the adults get drunk, so Harry has a good opportunity to get the memory. As a result of the Felix Felicis, Harry is able to get the memory with ease. –Harry thinking about Riddle's search for immortality. It turns out that in reality, Slughorn told Riddle everything he wanted to know about Horcruxes, how they were objects that a person can conceal a part of his or her soul in. This explains how Voldemort was able to survive his rebounding killing curse. Dumbledore believed that Voldemort made six Horcruxes: his diary (which Harry destroyed four years earlier), the Gaunt's Ring (which Dumbledore destroyed the previous year, greatly injuring his hand in the process), the locket, the cup, an object of Rowena Ravenclaw's and the snake Nagini. Harry learns the next day that Ginny and Dean have split up. He is unwilling to ask her out though, fearing Ron's reaction. Meanwhile, a recovered Katie Bell has returned to the school, and Harry asks who gave her the necklace. She states that someone Imperiused her in the girl's bathroom at Rosmerta's Pub in Hogsmeade. Shortly before the final Quidditch match of the year, Harry finds Malfoy crying over how his mission is failing. When he sees Harry, he attacks him. During the ensuing duel, Harry uses a spell written in The Half Blood Prince's book, which badly injures Malfoy. Snape witnesses the event, heals Malfoy, and gives Harry a large number of detentions that cause him to miss the match. Upon returning to the Gryffindor common room after his first detention, he discovers that the team had won the Quidditch Cup in his absence, and Ginny runs up and hugs him. At this point, Harry finally reveals his feelings for Ginny and kisses her. Both of them are ecstatic and start dating. Some time later, Dumbledore asks Harry to come to his office. On the way, he runs into his old Divination teacher Professor Trelawney, who was trying to hide sherry bottles in the Room of Requirement before being thrown out. She tells Harry that she heard a male voice (which Harry suspects to be Malfoy's) whooping before she was ejected, and also reveals that Snape had told Voldemort about the prophecy concerning him and Harry, which caused him to murder Harry's parents. Harry expresses outrage that Dumbledore later gave Snape a job at Hogwarts, but Dumbledore states that Snape felt great remorse for what he had done. He then asks Harry to join him in finding a Horcrux, Slytherin's locket, which Harry agrees to. Before leaving, Harry tells Ron and Hermione that Malfoy's almost certainly going to try something tonight, and gives them the remainder of the Felix Felicis. Dumbledore and Harry travel to a cave in which Voldemort had tortured two children in his youth. They proceed through the cave, coming to an island in the middle of a lake. On the island, they find a basin of emerald green potion, with the locket at the bottom. On Dumbledore's orders, Harry reluctantly force-feeds him the potion, which badly weakens him and causes extreme thirst. In an attempt to save him, Harry gives him water from the lake, awakening dozens of Inferi Voldemort had placed to guard his Horcrux. Harry attempts to fight, but there are too many of them. Just as he is about to be overwhelmed, Dumbledore creates a ring of fire around them, which fends off the Inferi, and allows them to escape with the locket to Hogsmeade, where they discover the Dark Mark above the astronomy tower at Hogwarts. –Dumbledore, at the Astronomy Tower. Borrowing broomsticks, the pair fly to the tower. Upon hearing someone approaching them, Dumbledore uses a charm to paralyse Harry and hides him under his invisibility cloak, before being disarmed by Malfoy. He reveals that he had let Death Eaters into the school through a pair of vanishing cabinets, which were the objects Harry had overheard him questioning Borgin about. Malfoy also explains that he was behind the cursed necklace and poisoned mead incidents, which were really assassination attempts on Dumbledore. Dumbledore reveals that he had known Malfoy was attempting to kill him, but allowed him to remain at Hogwarts because he knew that Voldemort would have murdered Malfoy once his cover had been blown. Dumbledore tries to persuade him to change sides, but the other Death Eaters join the scene and urge Malfoy to finish his mission. Then Snape appears, and with Malfoy still reluctant to finish off the unarmed Dumbledore, Snape kills Dumbledore. Released from the spell after Dumbledore's death, Harry pursues Snape through battle in the halls of the school and out onto the grounds. Near the entrance to Hogwarts, Harry attempts to curse Snape, who repels his attacks with ease and reminds the other Death Eaters they are not to harm the boy. When Harry tries one of the Half-Blood Prince's spells, an enraged Snape reveals that the spell is his own. He is the Half-Blood Prince, having taken the title when he was a student as a pun on his mother's maiden name. (Hermione's research later reveals that Snape's father was a Muggle named Tobias Snape and his mother a pureblood witch named Eileen Prince.) Buckbeak the Hippogriff attacks Snape, who leaves Harry behind and escapes with Draco Malfoy. When he returns to Dumbledore's body, Harry finds that the locket was a fake: the real horcrux was already stolen by someone with the initials R.A.B. After the battle, Ginny accompanies Harry to the hospital wing, where he learns that the only other person who died was a Death Eater. None of Harry's friends are badly hurt, apart from Bill Weasley, the Weasleys' oldest child who was attacked by an untransformed Greyback, although the only side effects are permanent scars across his face and a liking for rare steaks. Fleur expresses her desire to marry Bill despite his potential transformations, and she and Mrs. Weasley reconcile. Tonks reveals her love for Lupin, who had refused her because he was a werewolf. Professor McGonagall questions Harry about what he and Dumbledore were doing, but Harry, under orders from Dumbledore not to tell anyone except Ron and Hermione, refuses. The teachers then discuss the future of Hogwarts, and plans for Dumbledore's funeral. Harry turns his back on the Half-Blood Prince's book, and regrets ever possessing it, although Hermione and Ron comfort him, stating that while the Prince may have had a mean sense of humour, nothing in the book ever indicated that he was evil, or capable of murder. The funeral is attended by many witches and wizards, including a number of minor characters in the series. During the funeral, Harry ends his relationship with Ginny to protect her from Voldemort. She reveals that she had never given up on him; Hermione had advised her to go out with other people so she could relax around Harry, as previously she had trouble talking to him. As a result, he fell in love with her upon seeing who she really was, and regrets not asking her out sooner. Harry then meets Scrimgeour, who again makes the offer he'd made to Harry at Christmas, which Harry again turns down. He then tells Ron and Hermione of his intention to leave Hogwarts to destroy the Horcruxes and then Voldemort himself. His two lifelong friends agree to travel with him on his quest, and Harry happily acknowledges that there is "still one last golden day of peace left to enjoy with Ron and Hermione". On his own orders, both to make his death painless and to spare Draco from the influence of Voldemort and the Death Eaters, and possibly to control the next owner of The Elder Wand (Although this is unknown to everyone except Snape until Harry Potter and the Deathly Hallows). In early July, The Real Canadian Superstore, a big-box grocery chain in Coquitlam, British Columbia, Canada, accidentally sold fifteen copies of The Half-Blood Prince before the authorised release date. The Canadian publisher, Raincoast Books, obtained an injunction (PDF copy) from the Supreme Court of British Columbia prohibiting the purchasers from reading the books before the official release date or of discussing the contents. Purchasers were offered a Harry Potter T-shirt and an autographed copy of the book if they returned their copies before 16 July. In the same week, a Chicago Walgreens mistakenly sold a copy of the book. When the purchaser read about the Canadian incident on the Internet she said she would not turn herself in, but that she would not read the novel until the U.S. release date. Before and after the release of the book, the environmental organisations Greenpeace and the National Wildlife Federation urged consumers in the United States who planned to buy Harry Potter and the Half-Blood Prince to do so from the book's Canadian publisher, Raincoast Books cbc, which published on 100% recycled, chlorine-free, ancient forest-free paper. The American edition of the book, published by Scholastic Press, was printed with a percentage of recycled paper that Scholastic declined to make public. Along with Prisoner of Azkaban, this is one of the books in the series where the cover art for the UK and US editions depicts the same subjects. This, along with Chamber of Secrets, was the only book that did not end in King's Cross. (Chamber of Secrets ends in Platform nine and three quarters and the final sentence is going to King's Cross which does not count because no dialogue was shown in King's Cross). Before its release, a rumour circulated a chapter was to be entitled, "Lupin's Papers." Rowling responded that this was not the case, "nor will there be chapters entitled 'Pettigrew's Pamphlets,' 'Sirius' Circulars' or 'The Pocket Crosswords of Severus Snape'." Between the release of Half-Blood Prince and Deathly Hallows, fans wondered who "R.A.B." could be; many people believed it to be Regulus Black. J. K. Rowling would not explicitly say it was Regulus, but commented that he was a "good guess." Between the releases of the two books, she would drop hints about R.A.B. 's identity; one such hint was that the final book would introduce no new characters: this led many fans to believe it had to be a character introduced in a previous book. When Harry is hiding the Half-Blood Prince's book in the Room of Requirement, he opens a cupboard and inside is something in a cage that had long-since died; its skeleton had five legs; this could possibly be the skeleton of a Quintaped. Many readers believed that Dumbledore was not actually dead, and postulated many theories to explain how his death had been faked. A website was even created entitled "Dumbledoreisnotdead.com". J.K. Rowling later stated in an interview that "Dumbledore is definitely dead." This was definitively confirmed in Harry Potter and the Deathly Hallows. In the Simpsons episode "The Bob Next Door", Sideshow Bob spoils the book's ending by revealing that Snape killed Dumbledore, to which Bart complains he hadn't gotten to that part yet and Sideshow Bob responds "It's a four year old book!". Also, in the Big Bang Theory episode "The Spoiler Alert Segmentation", Sheldon reveals Dumbledore's death to Leonard while he reads it, much to his anger (though the book would have been seven years old at the time). This is the first book in the series where Harry was right about who the enemy was. In Philosopher's Stone they thought Snape was after the stone when it was Quirrell; in Chamber of Secrets they thought Malfoy opened the Chamber of Secrets, and that Hagrid opened it the first time, when it was really Riddle on both occasions; in Prisoner of Azkaban, everyone thought Sirius was a mass murderer and follower of Voldemort, when it was really Pettigrew; and in Harry Potter and the Goblet of Fire, they thought Karkaroff put Harry's name in the Goblet of Fire when it was really Barty Crouch Jr. The film version of Harry Potter and the Half-Blood Prince is the fifth and last appearance of Quidditch, apart from the burning of the Quidditch Pitch in Harry Potter and the Deathly Hallows: Part 2. Snape is revealed to be the Half-Blood Prince. This marks the second time someone at Hogwarts is revealed to be a wizard under a different name. The first was Tom Riddle when he was revealed to be Voldemort in Chamber of Secrets. This also marks the second time Harry Potter and Draco Malfoy duel. The film version marks the sixth appearance of the Hogwarts Express; the other times were Philosopher's Stone (Harry's first year), second time was Chamber of Secrets (Harry and Ron miss the train), third time was Prisoner of Azkaban (the train was stopped due to Dementors searching for Sirius Black), fourth time was Goblet of Fire, and fifth time was Order of the Phoenix. The film version marks the only time Draco Malfoy rides the Hogwarts Express. The Spanish version, the name is Harry Potter y el Misterio del Príncipe, which means Harry Potter and the Mystery of the Prince. Something similar happens in the second book. Slughorn called Ron Rupert during Aragog's funeral, ironically, the actor that plays Ron in the movies is called Rupert Grint. J.K Rowling may have intentionally done this, as she would obviously be aware that Rupert Grint played Ron Weasley in the movie adaptations of the books. Cheryl Klein served as the title's continuity editor. In the sixth year's first Potions lesson with Slughorn, where he offers Felix Felicis as a prize, he states that the vial contains "enough for twelve hours' luck." However, when Harry is considering taking it to get the memory from Slughorn, he tells Ron and Hermione that he would only need to take a bit of the potion, "not twenty-four hours' worth." This error, found only in the American version of the book, is corrected in later editions. On page one-hundred and one of the British version of Harry Potter and the Half-Blood Prince, Ron mentions that Hermione got ten Outstandings and one Exceeds Expectations for Defence Against the Dark Arts giving her a total of eleven O.W.L.s. However, as she dropped both Divination and Muggle Studies in her third year, she could not possibly have got eleven O.W.L.s as she was only doing ten subjects — Transfiguration, Charms, Herbology, Potions, Defence Against the Dark Arts, History of Magic, Astronomy, Care of Magical Creatures, Arithmancy and Ancient Runes. This error was corrected in later editions. On page 415 of the American edition, it says "...McLaggen took a ferocious swipe at the Bludger and missed it." In the original edition "missed" was mistakenly printed as "mishit." This was corrected in later editions. In the ninth chapter, it says, "Draco had a look on his face similar to the time Hermione had punched him." This is a mistake, because in the novel Harry Potter and the Prisoner of Azkaban, Hermione slaps him. This is true in the film adaptation, though, so J.K. Rowling may had mixed up the events of the films and the books. In the chapter "The Secret Riddle," ". . . Dumbledore entered the room . . . It was a small bare room with nothing in it except an old wardrobe and an iron bedstead." A couple paragraphs later, "Dumbledore drew up the hard wooden chair beside Riddle, so that the pair of them looked rather like a hospital patient and visitor." This error is corrected in later editions. On page three-hundred and forty-two of the American version, there is a punctuation error when Molly Weasley says "Have a little purkey, or some tooding...Oh dear, I mean-" to Rufus Scrimgeour. There are no quotation marks in front of the have in the statement. This is corrected in later editions. In Chapter 2, "Spinner's End," Snape tells Bellatrix he had sixteen years worth of information on Dumbledore to give to Voldemort when Voldemort returned in Harry Potter and the Goblet of Fire. However, the time between Voldemort's original downfall and his return was less than fourteen years. On page 446 of the UK version of Harry Potter and the Half-Blood Prince, it states that "after checking carefully that Neville, Dean, and Seamus were all in the common room..."
However, on page 447, after Harry has taken the Felix Felicis, it states that "Getting through the portrait hole was simple; as he approached it, Ginny and Dean came through it and Harry was able to slip between them." In Chapter 3 (Will and Won't), page 48 of the American version, Dumbledore places his wand in his pocket shortly after moving the couch under the Dursleys. A few lines later, it states that with a "third twitch of the wand" Dumbledore summons a bottle and five glasses. There is no indication that Dumbledore had taken out his wand again, and the timing of this action would seem to indicate that this is something of a mistake in the writing, albeit a small one. In the British audio books, when the Weasleys, Harry and Hermione are in "Weasley's Wizard Wheezes", the narrator says "Patented daydream charms" in a voice that might indicate calling. This is a mistake, as it is a sign on the product box and there are no quotation marks indicated in the print version of the book. The book was also adapted into a film, the sixth Harry Potter film of the series. The movie Harry Potter and the Half-Blood Prince was released on 15 July, 2009. It was directed by David Yates and the trio was portrayed by Daniel Radcliffe, Rupert Grint and Emma Watson. This page was last edited on 23 July 2015, at 13:53. This text is available under the GNU FDL and may have been adapted from the Wikipedia article about Harry Potter and the Half-Blood Prince (history).